In this sumptuous offering, one of our premier storytellers provides a feast for fiction aficionados. Spanning four decades and three prize-winning collections, these twenty-one vintage selected stories and thirteen scintillating new ones take us around the world, from Jerusalem to Central America, from tsarist Russia to London during the Blitz, from central Europe to Manhattan, and from the Maine coast to Godolphin, Massachusetts, a fictional suburb of Boston. These charged locales, and the lives of the endlessly varied characters within them, are evoked with a tenderness and incisiveness found in only our most observant seers. No matter the situation in which her characters find themselves--an unforeseen love affair between adolescent cousins, a lifetime of memories unearthed by an elderly couple's decision to shoplift, the deathbed secret of a young girl's forbidden forest tryst with the tsar, the danger that befalls a wealthy couple's child in a European inn of misfits--Edith Pearlman conveys their experience with wit and aplomb, with relentless but clear-eyed optimism, and with a supple prose that reminds us, sentence by sentence, page by page, of the gifts our greatest verbal innovators can bestow. Binocular Vision reveals a true American original, a master of the story, showing us, with her classic sensibility and lasting artistry, the cruelties, the longings, and the rituals that connect human beings across space and time. 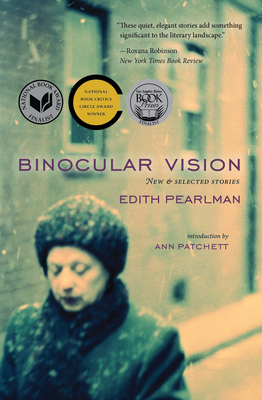 Edith Pearlman's new and selected story collection, Binocular Vision, won the National Book Critics Circle Award and was a finalist for the National Book Award as well as the Los Angeles Times Book Prize and the Story Prize. The author of three other story collections, including the New York Times bestseller Honeydew, she has also received the PEN/Malamud Award for excellence in the short story. Her widely admired stories have been reprinted numerous times in The Best American Short Stories, The O. Henry Prize Stories, and The Pushcart Prize. A New Englander by both birth and preference, Pearlman lives with her husband in Brookline, Massachusetts.